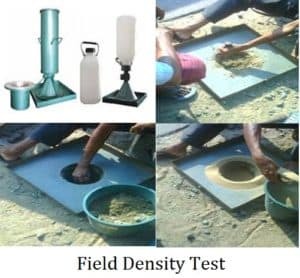 The sand cone method is one of the most common methods that are used for field density test in highway construction. The dry density test is carried out in the field to check the compaction of the layers. Compaction is very useful for preparing the sub-base grade and other layers of pavement. Compaction is done in the construction of embankment for increasing the stability as well as for decreasing the settlement. In field compaction, the compacting moisture content should be controlled first and the adequacy of rolling should be controlled by checking the achieved dry density and comparing with the maximum dry density. 1. First, take the weight of the empty sand cone and then fill it with dry sand and then weight again. 2. Collect the excavated soil from the hole and measure the weight. 3. After weighting, collect the specimen of soil to determine the water content in it. 4. Now place the sand cone on the test hole with the help of the base plate and allow the sand to run by opening the control valve. 5. When the sand stops running, close the valve and weight the cone with the existing sand. Finally, calculate the dry density of the soil by given below formula. If the test fails, compact and perform the test again. The volume of the hole = Mass of sand in hole/Density of used sand. Degree of compaction = Dry density × 100%/Maximun dry density. Sir how we can find the mixmum dry density in calculation?